I finally uploaded all the climbing photos I took while visiting my brother Matt in Mammoth Lakes, California. We went rope climbing at the gorge in Bishop, and bouldering at the Happies in Bishop. 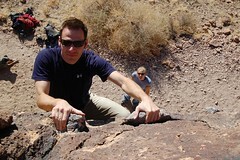 We climbed with his wife, Ericka, who is also a rock star climber, and their dog Zoey, who is quite a climber herself. I had so much fun that I decided to take up climbing. Tonight I climbed indoors for the first time at The Climbing Wall in Pittsburgh’s East End, which is conveniently a mile down the road from where I live.